Mary Lou Cowlishaw for GOP State Representative. 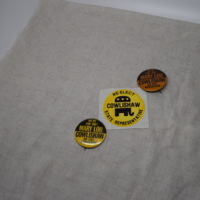 The Buttons are from the 1982 elections. The re-election sticker falls within her time in office, which was from 1983-2002.